For over half a century, Allpro Contracting has been the preeminent name in the Hinsdale remodeling industry. Throughout these decades, our professionals have been helping local residents and businesses with all their remodeling and renovation projects. Our team is adept at both interior and exterior remodeling services. When you hire our Hinsdale remodeling contractors for your next project, you are making the absolute best choice for your property. Whether you’re interested in kitchen and bathroom remodeling or building a new concrete patio in Hinsdale, IL, we’re the team you can count on for quality results. Our team proudly handles every size project with the same attention to detail and dedication to excellence. From remodeling a small interior bathroom to constructing brand new concrete paved driveways and walkways, our remodeling contractors put customer satisfaction as our highest priority. We promise to bring this mindset to task during your next project. For the highest quality interior and exterior remodeling services in Hinsdale, call Allpro Contracting today. Our professionals would be honored to assist you with your next project. With our help, you will be able to achieve all your property improvement goals. We can schedule your consultation today. At Allpro Contracting, our Hinsdale exterior remodeling contractors are especially skilled at all types of hardscaping projects. We can design and create stamped concrete driveways, walkways, and patios for you. Our team also works with concrete and brick pavers. With our help, you can create beautiful and functional hardscaping all around your property. As always, all of our services will be customized to you and your family’s specific needs. A well-designed wood deck can dramatically improve how you and your family use every portion of your property. You and your family can share a late night meal in the area. Your new deck will be the perfect launching place from which you can enjoy your entire back yard. Whenever you have friends or guests over to your home, you can entertain all of your loved ones on your wood deck. At Allpro Contracting, our Hinsdale remodeling contractors can help you design and construct a deck that will be perfectly customized to all your foreseeable uses. Your new deck will be highly functional and will add substantial long term value and enjoyment to your home. 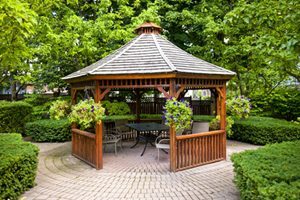 If you are looking for a professional Hinsdale remodeling contractor for patios, driveways or other interior and exterior services, then please call 708-658-3500 or complete our online request form.